Rapunzel. Happily Ever After. An auto-jumping mobile game inspired by drawings of my little daughter. itch.io Community » Game Development » Devlogs · Created a new topic Rapunzel - Happily Ever After. Mobile Game inspired by my little daughter. Rapunzel is a game heavily inspired by some of the drawings made by my five year old daughter. At her age she has already some incredible drawing skill - at least in my opinion. During the last year she fell in love with Rapunzel. For those who don't know. Rapunzel is a fairy tale / story of a princess kept in a tower by an evil queen. In order to rescue her a prince tries to climb up that tower using Rapunzels hair as a ladder. My daughter was drawing this scene over and over again, resulting in having hundreds of different drawings of the same content. One day I got so inspired by her drawings that I said to her that I will make a game of it. Story is simple. Rapunzel is locked inside a very high tower and a prince is coming to rescue her. Since I intended the game to be a mobile game which I want to release on the iOS platform I wanted to have very easy controls. So moving the player left / right is done with accelerometer-input of the mobile device. To keep controls even more simple I had the idea of making Rapunzel an auto-jumper like the famous doodle jump. With this concept in mind I was pretty sure that Rapunzel will be very easy to control and to understand. So the player can focus on gameplay and dive into the atmosphere. Since auto-jumping has nothing to do with climbing up a tower I was thinking of a different style of „getting up that tower". And when thinking about „Doodle Jump" I already knew that the Prince - the main character - has to continuously jump up that tower using enemies, windows, Rapunzels hair ribbons and lot's more as platforms. What was a bit challenging was to find the answer to the question how to express that graphically. 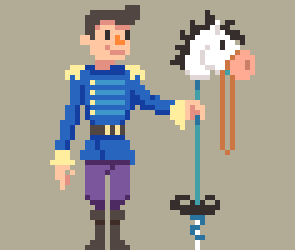 I remembered one of my favorite dos-games „Commander Keen" and the famous Pogo-Stick Keen was using. And again my daughter inspired my to combine this Pogo-Stick with a Hobbyhorse (that Horse-Head on a stick thing) making it the first ever Hobbyhorse-Pogo-Stick. But most important. That picture in my mind about the prince using that Hobbyhorse-Pogo to jump up that tower in order to rescue Rapunzel made me laugh. I instantaneously loved it! And I knew I have to make that game! Since coding is one of my hobbies since being 8 years old (years years ago) I absolutely had no problem when thinking about how to implement the gameplay in code. But concerning the graphics I already knew at the beginning of Rapunzel that I will have to find someone. What was clear was that Rapunzel will be drawn in Pixel-Art style which I personally love so much. During the search of a pixel-art artist I stumbled over Fiverr.com and found a very very talented Artist called Milos Kostic. After having some conversations we ended up with what I would like to show in this devlog. 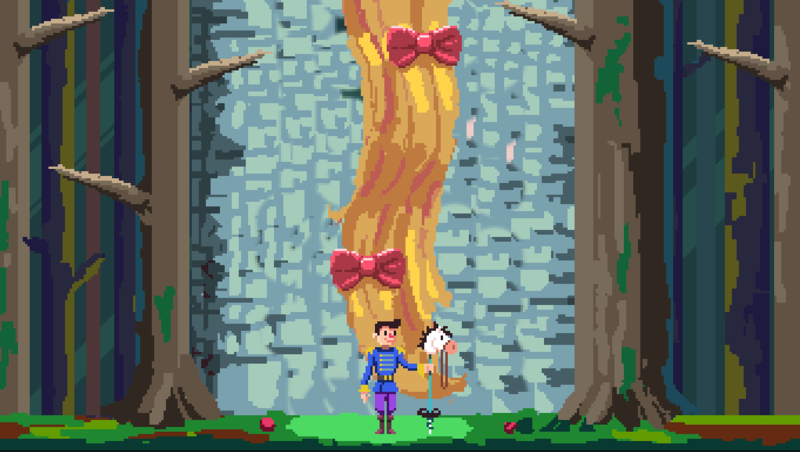 Rapunzel is still in a very early stage of development. It will be written in Apples new language Swift and uses SpriteKit as the main game engine. Collision detection and particle system is done by myself as well as the parallax scrolling algorithm which uses a special well performant „smoothness"-algorithm. „Juice-It or Loose-It"
Since we both are doing this in our spare time Rapunzel has currently no deadline or milestones bound to a defined date. And I absolutely do not want this since making games should be fun - in order not to loose the fun in and on the game. I love coding so I've planned to release all code and techniques I used in Rapunzel in a blog and as open source but keeping a copyright on the graphics and sounds. I plan to periodically release development updates to get feedback on the progress we made so far. And this is greatly appreciated and will be incorporated into the design of the game. Also any feedback will help me continue since I really do not know if this will be a success or if I just waste my time on it. Since you'll never know! So for now I hope you enjoyed reading this and also think that Rapunzel is a great game. At least my daughter already does ;-D.
What do you think about Rapunzel, the gameplay, the idea and how it looks? Let me know!